Discussion in 'Modding' started by Ebel, Oct 11, 2016. Part I: Basic implementation of the building. - You will also need a texteditor, I use sublime text, but you could use notepad ++ as well. - We'll keep it simple, and just add the building to the mission nation, so it can be placed ingame in the editor. - We will use the blockhouse as a reference to copy files from. This will speed up the implementation of the building greatly. - It is best that you use the same name everywhere for the building, it will be less confusing, and you'll make less mistakes. So, let's name this building "miscas". 9. Open Cossacks 3\data\objects\buildings\miscas.prop , find and replace all instances of 'misblg' with 'miscas'. Save the file. Copy it, paste it just before section.end at the bottom and change misblg to miscas. Save. You could ofcourse also copy the entire 'misblg' section, paste it under it and make adjustments to the building properties here ( HP, price, etc) . Let's not bother with that for now. 12. Open data\scripts\lib\country.script and find '// MEMBERS'. The mission nation is right below it. Copy the line with 'misblg' and paste it under it. Change the name to miscas. - I urge everyone to take a copy of your \Steam\steamapps\common\Cossacks 3 folder, and copy it on your desktop. Work on this copy, so an update from a patch doesn't overwrite your files or when you derp you don't have to reinstall files. - Take advantage of the external editor , rather than using the internal editor. If you mess up, you will get a blackscreen with the ingame editor, and you will be none the wiser what happened. If you use the external editor, the debug log will tell you that something has gone wrong, and usually what has gone wrong. Sometimes it will even tell you in which file and which line there is something wrong. I made at least 3 mistakes while doing this , in one occassion I simply forgot to save my changes, and without the debug screen, you could spend an hour trying to figure it out. - Yes, the building is rotated wrong, and many many more things will be needed to get this building setup properly, but this was just a very basic guide on how to get the new building ingame. Build points will have to be setup, collision mask, collision box, smokepoints, text description, building properties, decals and then later assign it to a proper nation, add it to the peasants building menu,....but that will be for another part of the guide. Part II: Adding a description, rotate/scale, smokepoints and groundtexture. Part III: Adding collision mask, Shotpoints, Properties, Build and DeathStages. - Setakat for the guide on adding units, which has been helpful to make this somewhat easier to figure out. Johny and Setakat like this. Could you mention how you managed to spawn a building into the external editor? I've been trying to do some stuff relating to replacing mounted infantry, but the ingame editor sometimes blackscreens out. If the external editor works, I might actually be able to figure out what I'm missing/not doing correctly. 1. Go to Advanced - Player -> Add a player, and select "Race" buildings, or leave to 'units' if you want to spawn units. 2. Go to Layer - Players (CTRL+ALT+U)-> Click on buildings/units depending on what race you chose in previous step. A tree will open will all the units or buildings. Then simply place on the map. To 'stop' placing, press the spacebar. I will definitely try to make at least one buildstage and one death stage for it tomorrow night. It was in my plans, but not in my priority. Definitely is now! Also those screenshots made me realise a few problems. - First of all, it has the wrong rotation for the reason that when I tried it by replacing the Austrian Temple, it was rotated this way so I had to adjust. There must be something in the file where you can set the default rotation for a building because when importing the Austrian temple into my 3d application, there was both rotated the correct way. - Secondly, something is happening with the normals on the tower. I will have to fix that. I'll add more details later. Fantastic. Cant wait to see the rest of the guide! If you don't rename them, then make sure you use the correct names when implementing. 15. We'll start simple, with a description for the building. I have no interest in translating it to every language ingame, so we'll add the description in the 'en' folder. %pos%Can only be destroyed by cannons, ships, grenadiers or archers. Now run the batch file by double clicking on it. 16. Lets rotate the building a bit, and rescale it a bit aswell just so you know how. 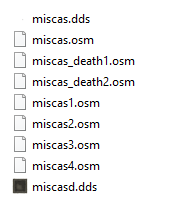 Put the castle model (miscas.osm) from castle_02.zip into your Cossacks 3\data\actors\buildings\mis\ folder because Hugo seems to have rotated the model in the second pack. Just overwrite the existing one. 17. Lets work a bit on the 'selection box', because this was based on the misblg, which is smaller. Load up the editor (editor.exe) . We'll place the building right here (Add a player in Advanced - Player -> Add a player, and select "Race" buildings. Then go to Layer - Players (CTRL+ALT+U)-> Click on "buildings". A tree will open will all the buildings. Place the building on the map. Press the spacebar to stop placing. Now go to View- Universal manipulator, and tick on "Bounding box and CustAABBinSP" in the top section. When dragging over the building to select it, you will instantly see the blockhouse selection box appear. We have to fix this up to match this new building. It's not perfect but at least the box is larger now and easier to select. You can tweak the numbers more, but I'm sure GSC will release a tool/script to get these values more accurately when the workshop comes . 19. Lets add some smoke points now so its more visible if it is under attack. Find the section we just added in previous step. It's not perfect, but doing this manually is tedious. I wont add anymore smoke points because of this. I'm sure gsc will release an editor/Script to add these. Note: You can see these points in the editor, if you select the building, and then go to Scripts-> Smokepointshowpickedbuilding. In this same file you can add exit points, but since the castle doesnt really have an 'open' door for units to come out, i won't. 20. Let's setup the collission mask . In editor you can see the collission mask by going to View - Collission. 21. Now, although it's using the properties of the blockhouse, it can't shoot yet untill we add shotpoints. They are not perfect, but it's too tedious to do this manually. It will be able to shoot in all directions now. 22. Let's add it to a peasants build menu in the mis nation. Make sure to add the line with 'miscas' as shown above. 23. Lets give our building its own properties now. Now delete the , 'miscas' part which we added in previous part of the guide. It shoots like a tower now, rather than a blockhouse, I left the blockhouse weapons in there though, just in case you want those. 24. Let's add the build and deathstages now. Note: The textures are weird during buildstages, something Hugojackson needs to work on. 25. Time to try in the editor. It should be fully operational now. It can be built, it can shoot, it can be attacked. - Next part of the guide will be about attachments : scaffolds, flags. If there's anything else anyone want explained: Ask! // Go to Script and look at all the AABB options there. Use the hotkeys to resize the box to match the building. // You will want to rotate the building often to see that it matches the walls roughly. // Sadly no way to save these points apparently or I simply haven't figured out how. If someone feels like figuring this out, please do, it would save a lot of time. Not impossible to change, but not really related to this guide. - I notice a small shift between the last buildstage and the building appearing fully built, it's barely visible but it's there. Are the models exactly in the same spot when exported? - Maybe we should have an 'open door' in the model to let units come out of the building? Else its gonna be weird to have them come from behind the building if anyone would make the building being able to have units recruitable from it. I notice a small shift between the last buildstage and the building appearing fully built, it's barely visible but it's there. Are the models exactly in the same spot when exported? I did think about it, I'll just open the door I have. No problem. I might do another version with a gate on the right side at one point, but thats not in my priorities. And yes, I DO need to fix all the textures for the build stages as I said in my initial post. They are all over the place at the moment but I wanted to have something out in terms of models asap for you to continue. You can clearly see the deadzone's. In the shotpoints section, its not fully covering all the angles. It's setup to 5-85/95-175/185-265/275-355. So it lacks about 10° on each side where it simply can't shoot. Knowing this, you'll loose less units when approaching the blockhouse from the corners to kill it. New version of the building here! I've included an Icon.psd template, might be useful for whoever wants to make icons! Guys maybe i have read wrong but i still don't understand. 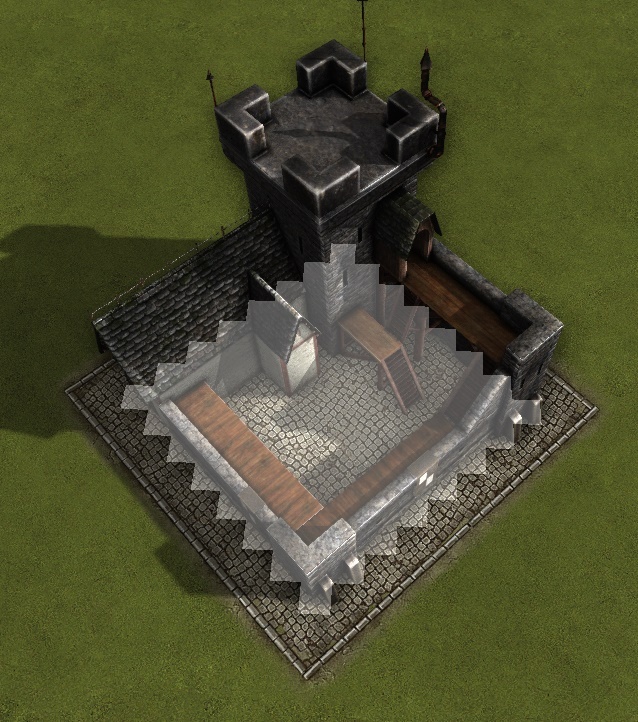 I added to building option to peasants go inside but can't take them out i mean haven't icon like in mine. So help me pls to add icons: go outside, shoot, stop shoot, etc. How to do this? the new custom made buildings can be scripted to train and build recruits from them?